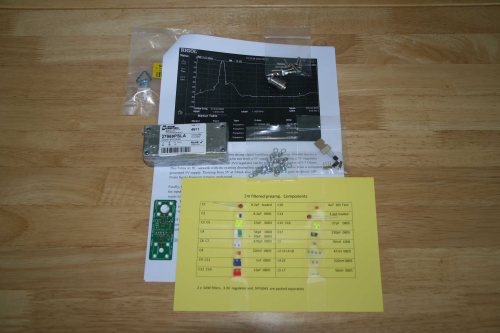 The kit from AMSAT‐UK contains all the parts and hardware necessary to build the G0MRF 2m filtered preamplifier. With all the nuts and washers and mounting hardware, there are over 60 individual parts to this project. The connectors supplied are a high quality PTFE insulated reduced flange Ntype for the connection to the antenna and a chassis mounted female BNC for the RF output to the receiver, this also carries the 5 V DC input from a FUNcube dongle or the DC supply from an external bias tee or radio. Read the Construction Notes here.